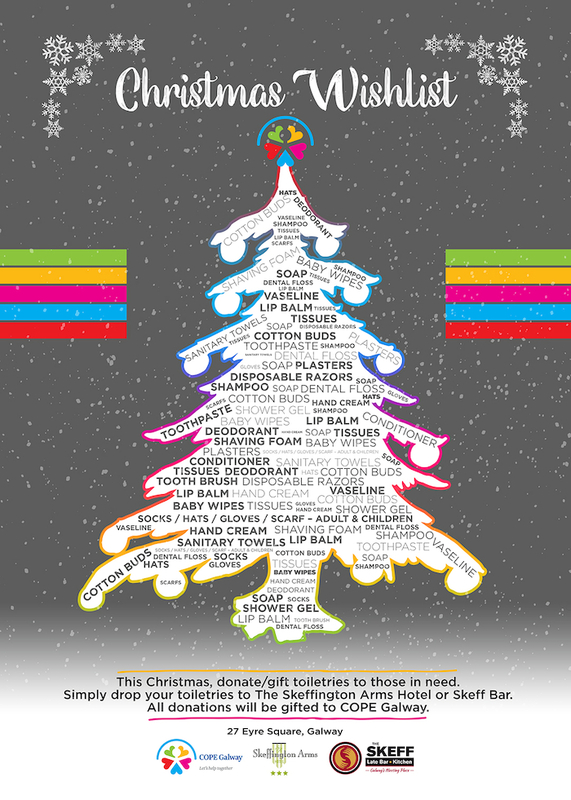 Advertiser.ie - Toiletries wanted for Christmas Wishlist for COPE! In the build up to Christmas, The Skeff Late Bar & The Skeffington Arms Hotel will be working closely with COPE GALWAY. The Christmas Wishlist campaign was launched last week. This campaign consists of collecting toiletries, hats, scarves, gloves for people affected by homelessness, women and children experiencing domestic abuse and older people. Simply drop your gift/donation to The Skeff Late Bar or Skeffington Arms Hotel over the next two weeks and these will be distributed to those in need just before Christmas. “If everyone added one item to their weekly shop for the ‘Christmas Wishlist’ it would be a huge support to individuals and families in the Galway area, said Nicola Kerrigan, (marketing & events – The Skeff late bar ). Furthermore, The Skeff will be once again this year will work with COPE Galway, sponsoring and taking an active role in the organisation of a Christmas Party for the elderly in December. If you would like to make a gift donation to the Wishlist campaign, simply drop into The Skeff, Eyre Square.